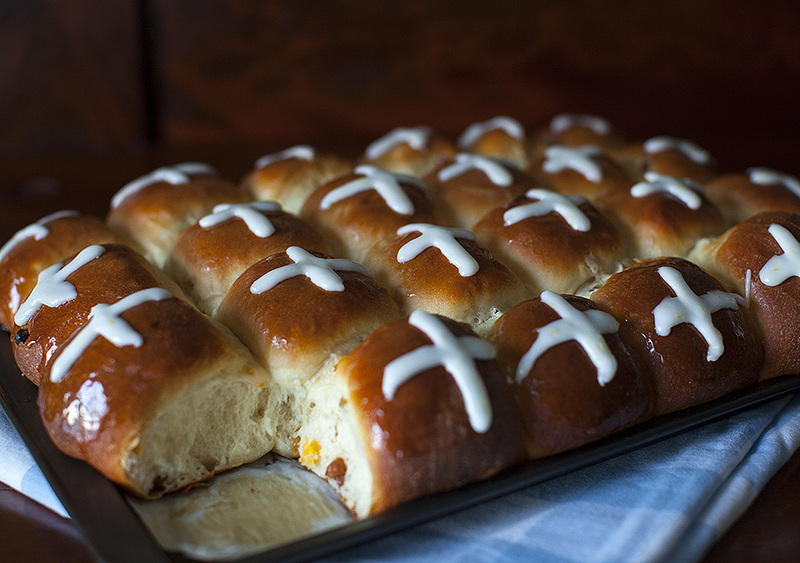 Hot Cross Bun recipes will be pouring over the internet for the next week or so, still, I couldn’t help but share this recipe, given to me years ago by a friend of the author, Diane McConnell. I’d only ever tasted the grocery store variety – which I loved! What’s not to like about soft, heavily spiced buns slathered in sugar? Every Easter, I looked forward to seeing them appear for sale, with no thought of ever baking my own. Until, I tasted this recipe. I sent a face book message to Diane asking for permission to share her recipe. I was delighted that she agreed! Diane uses currents and chopped dried apricots instead of the usual dried peel. The combination of apricots, dried mace and lemon is delish. I swapped out the currents, called for in the original recipe, for golden raisins only because we’re not big current lovers The dough is really soft to work with so be prepared. Don’t be tempted to add more flour to stiffen it up. You’ll spoil the bun’s tender interior. Once the buns are out of the oven, use a natural pastry brush to paint on the sugar glaze. Synthetic bristles don’t hold syrup the same way. 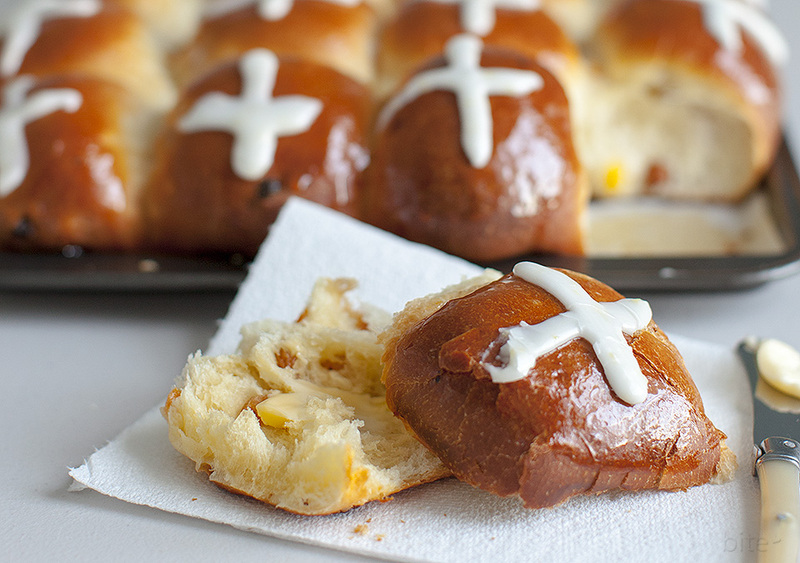 Then, let the buns cool completely before adding the crosses to turn them into Hot Cross Buns. You want your lemon frosting to hold the shape of the cross. British folklore surrounding Hot Cross Buns says, if they’re made or served on Good Friday they’ll stay fresh all through the year. I’m not sure if that’s true because they never stick around long enough for me to find out! In the bowl of your stand mixer or a large mixing bowl, combine water, milk, butter, sugar, salt and eggs. Don’t worry about the small lumps of soft butter, they’ll mix into the flour. In a separate bowl, mix quick rise yeast, pinch of sugar, 1 cup of flour, raisins, chopped apricots and mace. Add flour mixture to liquid and beat well. Slowly add remaining the flour, half a cup at a time, just until a soft dough pulls away from the bowl. Remove the dough to a floured work surface and knead several times by hand to make a nice ball of bread dough. Use a light touch – the dough is super soft. Butter a large mixing bowl, place the shaped dough top side down and move it around the bowl to coat the top with butter. Turn dough over, cover bowl with plastic wrap and a tea towel. Allow the dough to rise until to doubles in size. The time will vary depending on the warmth of your home and any drafts you might have. I let mine go for 4 hours. Once the dough has doubled in bulk, dump it onto a clean work surface. Gently roll the dough into a rectangle, roughly 12 inches long. Divide the dough evenly into 24 equal pieces. I weighed mine – 3 ounces each. Shape the pieces into buns by gathering the corners and pushing the dough to the centre. Then cup your hand over the dough ball and with just your finger tips touching the work surface, make circular motions until your buns has a perfectly round shape. Place the buns in the baking dish then cover the pan with a tea towel. Allow the buns to double. Again the time will vary. It took mine 2 hours. Bake on the bottom rack in your oven for 20 minutes. 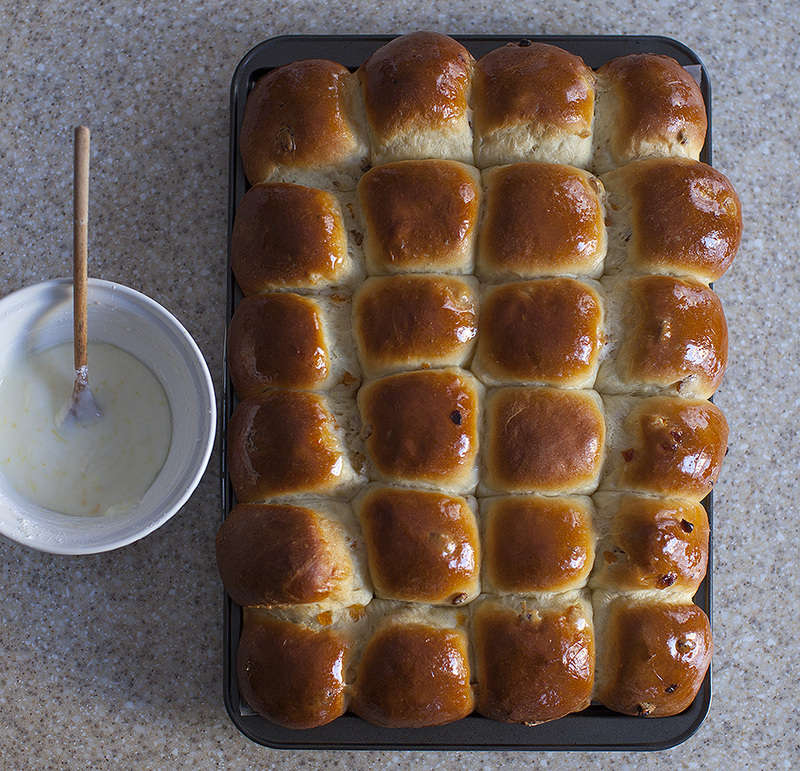 Remove the buns to a cooling rack. Place sugar and water in a small pot over high heat. Remove from heat then brush over the tops of the buns. Allow the buns to cool completely before adding the frosting. Place ingredients in a medium bowl. Beat together until a thick frosting id formed. Add a little extra milk if your frosting is too thick. Make crosses on the buns. THE LOVE: I can’t stress enough how important it is to let the dough guide you. Let it take as long as in needs to raise both times. It’s the secret to fabulous bread! Hopefully, Easter will see the end of the worst winter we’ve ever lived through. Beyond the endless snow, Dad’s accident was terrifying, for all of us. Seeing him now, ruthlessly pushing through his convalescence, he’s back. He and Mom are walking up to five kilometres, as often as they can get outside. Part of me wants to put him in a bubble to keep him from ever hurting himself again, but that’s not going to happen. He’ll live his life as he always has. Five broken ribs, a broken vertebra and cracked pelvis was not going to slow him down, for long. I’m trying to reconcile the risks involved having a dad that can leap tall buildings in a single bound. I will. I have no choice. This entry was posted in yeast breads and pizza and tagged Easter recipes, sweet bread recipes, sweet buns by Michelle. Bookmark the permalink. You may have convinced me to make some. I’ll just need to find a few friends to take some off my hands (I could eat a dozen buns myself, but I shouldn’t! )–that shouldn’t be too difficult! They freeze well too! but I’m sure your friends would be delighted.